Earache usually occurs in children than adults due to their low immune system. It can be caused by ear infection, wax inside the ear, blockage in the nasal passage, trapping of polluted water in the ear, enlargement of adenoid, wisdom teeth and having a cold. Some common symptoms are fever, nausea, vomiting, swelling, itching sensation etc. However there are some effective home remedies to get rid of this problem. 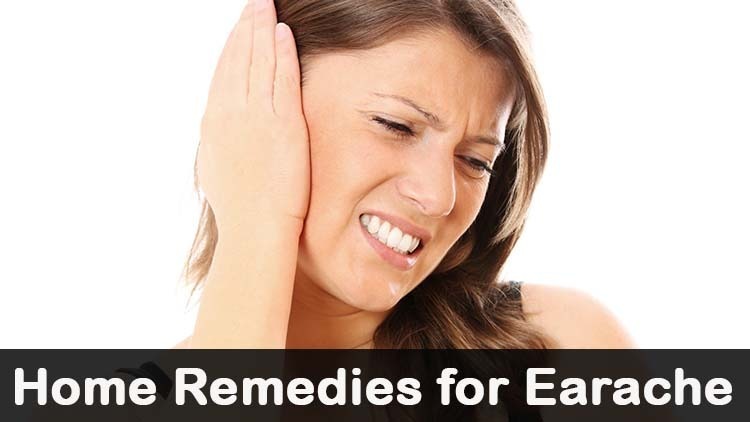 Try these natural remedies to cure simple earache problems. Garlic contains antibiotics and analgesic properties which help to reduce and cure the pain. Heat 1 teaspoon of minced garlic in 2 tablespoon of sesame oil. Cool it for a few minutes and filter the oil. Pour 2 -3 drops of this in the ear. Or Pour 2 drops of juice extracted from the garlic cloves in the ear. Follow this remedy twice a day. Ginger is a natural painkiller which helps to get rid of the pain. It also acts as anti inflammatory to reduce the infection. Crush and extract the juice from fresh ginger. Pour this juice directly into the ear. Repeat twice a day to get relief. Mix 1 tablespoon of fresh ginger with 1/4 cup of warm sesame oil. Leave it for few minutes to cool. Apply it externally around your paining ear. Repeat the remedy as needed. Onions contain antiseptic and antibacterial properties which help in treating the earache. Crush a fresh onion and wrap in a piece of cloth tightly. Crush a grated onion to extract the juice. Heat slowly until it gets to lukewarm. Put 2-3 drops of this juice into the infected ear. Moist heat opens the eustachian tubes and cures the earache. Cover a hot water bottle in a towel. Hold it against the aching ear and press it for few minutes. Wring out a towel in hot water. Place it against the affected ear and hold it for few minutes. Repeat it whenever you feel necessary. Bishop’s weed oil posses pain killing properties which helps to cure the earache. Strain and use as ear drops to reduce the congestion and also to get relief from pain. Mix a teaspoon of bishop’s weed oil with 3 teaspoons of sesame oil. Pour 5 drops of this oil mixture in the ear. Pour 2 -3 drops of bishop’s oil directly into the infected ear to ease any pain. Do this whenever you have earache. Olive oil acts as a lubricant agent and helps to reduce the ear ache and the infection. It also eradicates the buzzing sensations inside your ear. Warm a few drops of olive oil. Remove the heat after it becomes lukewarm. Put 4 drops of warm olive oil into the ear canal using a dropper. Repeat the process if it is necessary. You can also use mustard oil or coconut oil in the place of olive oil. Mullein flower oil helps in relieving the earache which is caused by ear infection. Dip the cotton ball into mullein oil and place in your ear. Take it off after few minutes. Repeat the process whenever you get ear pain. Mix a few drops of garlic juice with mullein oil. Pour few drops of this oil in the affected ear to get rid of the pain. You can use olive oil in the place of garlic and mullein oil. Repeat the process when you feel ear pain. Radish is a root vegetable which helps to reduce the pain by clearing the wax. It also reduces the inflammation. Warm them in a mustard oil for 5 minute. Let it come to room temperature before straining. Put few drops of oil into the infected ear. Peppermint has anti inflammatory, anti-bacterial and mild anesthetic properties. It also acts as a soothing agent. Mix a drop of peppermint oil with 5 drops of olive oil. Put this oil in the ear using an ear syringe. Some people are sensitive to peppermint oil, so mix with more olive oil. Crush a few peppermint leaves to get the juice. Apply this oil externally around the ear, massaging the area gently. Make sure not to get any in the ear. Steam helps to open up the Eustachian tubes and reduces the inflammation. Place your face over hot water and cover it with a towel so that the steam will not escape. Inhale the steam from your mouth and nose to clear up the infection. Licorice herb helps to lower the inflammation and eases discomfort. Warm licorice slightly in clarified butter. Apply this externally around the ear. Basil leaves have antibiotic properties which help to cure the earache and the infection. Crush the juice from a few basil leaves. Strain the juice and pour 2 drops into the affected ear. Diet can play an important role in reducing ear pain, so follow these tips. Eat foods which are rich in vitamin A and C (fruits and vegetables). Consume foods which are rich in zinc. Avoid taking the mucous forming food like wheat, dairy products, oranges, peanut butter, citrus fruits, bananas etc. Drink plenty of water and herbal teas like chamomile tea, basil tea, ginger, honey tea to get rid of the earache. Eat foods rich in amino acids, omega-3 fatty acids, fresh fruits and vegetables. Avoid over processed meals and junk foods. After taking shower, use a hair dryer to blow onto your ear gently on a low setting. Do not use for more than 5 minutes. Whenever you go outdoors, wear a scarf which helps to cover your ears from wind. When you’re in a plane, the change in pressure can cause pain. Chew gum or candy that will activate the muscles that send air into the inner ear and equalizes the pressure. Yawning helps to cure ear pain as it opens up the Eustachian tube. Prevent the cold, flu and other allergies. Gently rub lavender oil around your ear to get soothing effect. Avoid swimming until you get relief from the earache. Or simply coat your ear with a few drops of mineral oil before head. Avoid taking antibiotics as it harm to your body. Don’t give aspirin to your children as it leads to another health problem. Quit smoking and drinking alcohol as it can increase your earache. If the pain not cured in 3- 4 days or if the earache is severe then consult doctor. Take the advice of your doctor whether to use these remedies for children. Yes, you can pour the combination in the ear to treat the ear infection.